The arguments of the law’s defenders don’t stand up to scrutiny. 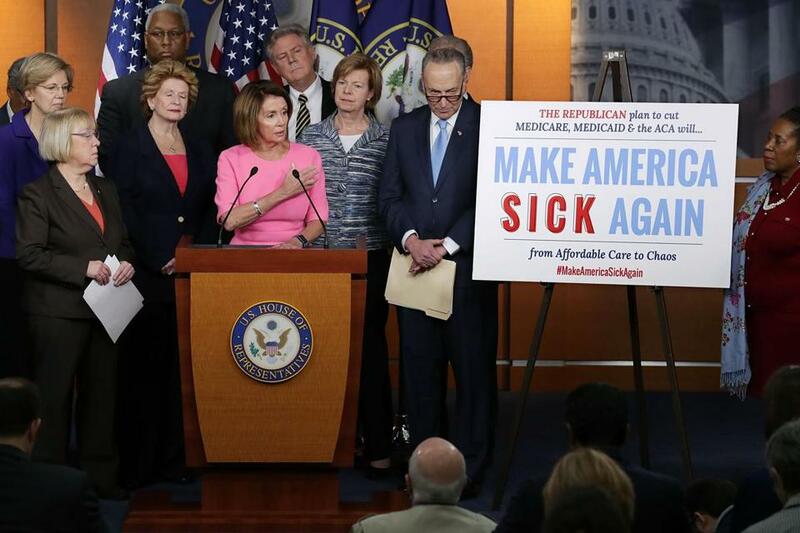 Repealing the Affordable Care Act, Democrats say, will “make America sick again.” Bernie Sanders warns “36,000 people will die yearly as a result.” But as with most ACA defenses, these claims describe an imaginary health-care reform that works, not the legislation passed by Congress in 2010. In reality, the best statistical estimate of the number of lives saved each year by the ACA is zero. Some studies do suggest that health insurance can saves lives. But these focus either on individuals with private coverage or on the Massachusetts health-care reform law of 2006, which primarily expanded private coverage within the Bay State. The ACA, by contrast, is primarily an expansion of Medicaid; in recent years, the share of Americans with private insurance has declined. In 2007, just prior to the Great Recession, 66.8 percent of non-elderly Americans had private insurance. By 2015, two years into the ACA’s expansion, that share had declined to 65.6 percent. Taking the larger economic picture into account by looking back to 2007 is crucial, because the private-insurance rate fluctuates with employment. Between 2007 and 2010, employment fell by 5.5 percent and private coverage fell by 7 percent. Between 2010 and 2015, employment rose by 8.8 percent and private coverage rose by 9.5 percent. ACA implementation has coincided with an increase in private coverage because it occurred during a period of job growth. But 300,000 fewer Americans have private coverage today than would have it if the ratio of coverage to employment had remained at its 2007–10 level over the last six years. Instead, the ACA has increased insurance coverage by expanding Medicaid. In 2007, 18.1 percent of non-elderly Americans had public insurance. By 2010, that share was 22 percent, and rather than declining as the economy recovered, it continued to climb all the way to 25.3 percent in 2015. This public-versus-private distinction is crucial, because studies of Medicaid do not find the same positive effects on mortality sometimes seen in studies of private insurance. Researchers have found that Medicaid patients with a variety of conditions and medical needs experience worse outcomes than similar uninsured patients. In a randomized trial in Oregon that gave some individuals Medicaid while leaving others uninsured, recipients gained no statistically significant improvement in physical health after two years. In the New England Journal of Medicine, a team at Harvard University compared three states that expanded Medicaid in the 2000s with others that made no change; only one of the three achieved a statistically significant reduction in mortality. In the Journal of the American Medical Association, Stanford University’s Raj Chetty and colleagues looked for determinants of life expectancy for individuals in the lowest income quartile and found that health-care access was not one of them. There is one exception to this trend: Medicaid may have significant positive effects on pregnant women and young children. But once again, the ACA is not that policy. Under the Children’s Health Insurance Program, created with bipartisan support in 1997, those groups were already eligible for Medicaid or a comparable program at the income levels to which the ACA expanded coverage for other adults. An identical 42.2 percent of children had public-insurance coverage before the ACA’s Medicaid expansion in 2013 and after its expansion in 2015. Had mortality continued to decline during ACA implementation in 2014 and 2015 at the same rate as during the 2000–13 period, 80,000 fewer Americans would have died in 2015 alone. Public-health data from the Centers for Disease Control confirm what one might expect from a health-care reform that expanded Medicaid coverage for adults: no improvement. In fact, things have gotten worse. Age-adjusted death rates in the U.S. have consistently declined for decades, but in 2015 — unlike in 19 of the previous 20 years — they increased. For the first time since 1993, life expectancy fell. Had mortality continued to decline during ACA implementation in 2014 and 2015 at the same rate as during the 2000–13 period, 80,000 fewer Americans would have died in 2015 alone. Of course, correlation between ACA implementation and increased mortality does not prove causation. Researchers hypothesize that increases in obesity, diabetes, and substance abuse may be responsible. But thanks to the roughly half of states that refused the ACA’s Medicaid expansion, a good control group exists. Surely the states that expanded Medicaid should at least perform better in this environment of rising mortality? Nope. Mortality in 2015 rose more than 50 percent faster in the 26 states (and Washington, D.C.) that expanded Medicaid during 2014 than in the 24 states that did not. Further, while two years is not enough time to evaluate a policy’s full effects, that is exactly the period over which the Massachusetts study found substantial mortality gains. (Look at the graph on page 589 — the entire improvement from the 2006 reform is achieved by 2008.) Two years of gains from a different policy implemented by a single state a decade earlier can hardly be proof that the ACA saves lives when the ACA’s own two-year track record tells the opposite story. If one wants to claim dramatic effects from ambiguous data, it is easier to argue that the ACA is killing people. A more reasonable conclusion for partisans of all stripes to accept is merely that the ACA is not saving lives. In statistical terms, neither the accumulation of past Medicaid studies nor current data can disprove a null hypothesis. What about the specific individuals who can show they have benefited from the ACA’s various provisions, typically by gaining access to costly treatment for a life-threatening condition? Their situation represents a challenge that post-ACA policy should aim to address. But their cases should not be taken as evidence that the ACA has been a broader net benefit to public health. One more Medicaid study, published last year in Health Affairs, provides perhaps the best lens for policymakers. There, researchers from the Yale School of Public Health found that states allocating less of their social-services funding toward health care had significantly better health outcomes. In other words, efforts to improve public health must remember opportunity cost and ask: What is the best use of the government’s limited resources, especially when it comes to improving the lives of lower-income Americans? The answer to that question is not the ACA.